This album recreates the atmosphere and feeling of the 1930s comedies from the Hal Roach Studios, the Lot of Fun where Laurel & Hardy, Our Gang, Charley Chase, The Boy Friends and Thelma Todd created their biggest successes. These short films were usually enlivened by the catchy background tunes composed by Leroy Shield (1893-1962). Although the titles of these tunes remained known only to insiders, the music is all too familiar to anyone who ever saw Stan and Ollie embark on one of their doomed journeys. Trained as a classical pianist, Shield eased into the new medium of film music with apparent ease and knocked off dozens of short, catchy background tunes in record time. It is not funny comedy music in itself; rather, it ranges from slow, sentimental ballads to up-tempo dance numbers. Sometimes, there are echoes of Stravinsky. Tracking down original sheet music took years of detective work. For the first time in history, this CD contains renditions of original piano music and original piano transcriptions made by Shield himself written before the orchestral versions were recorded of tunes such as "All Together", "Little Dancing Girl", "Gangway Charlie", "Riding Along", and "The Moon and You". It also contains piano transcriptions of Shield's background tunes from 1930-31 as originally published as loose-leaf sheet music: "Bells", "You Are The One I Love", "In My Canoe", "On to the Show", "Riding Along" and "Good Old Days". 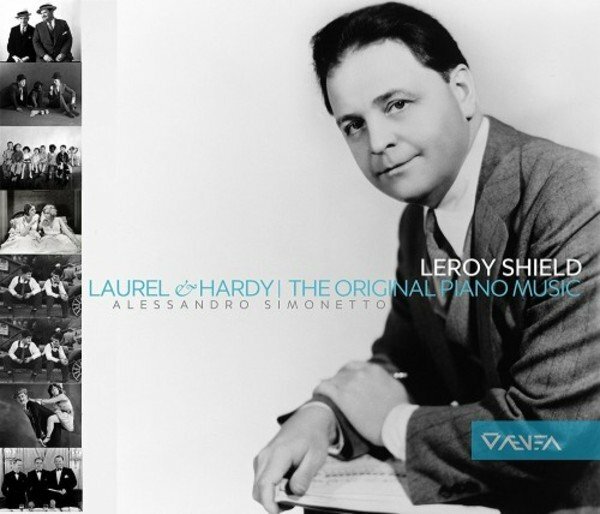 Originally published in 1931 but today impossible to find, the Leroy Shield Song Album is a collection of ten popular film background tunes transcribed for piano: "Prelude", "Brides Song", "Here We Go", "Look at Him Now", "Cascadia", "Dash and Dot", "Lets Go", "Antics", "Give Us a Hand" and "It Is to Laugh". Finally, this collection includes Simonetto�s piano transcriptions of Shield's stock music used in various films around 1935-36 and some excerpts from the Our Relations music score, including "We're Just a Happy Family", "On a Sunny Afternoon", "Just a Kiss" and "Dancing on the Clouds".